For the Znamenny Icon of the Theotokos, see Our Lady of the Sign. An example of Znamenny notation with so-called "red marks", Russia, 1884. "Thy Cross we honour, oh Lord, and Thy holy Resurrection we praise." Znamenny Chant (Russian: Знаменное пение, знаменный распев) is a singing tradition used in the Russian Orthodox Church. Znamenny Chant is unison, melismatic liturgical singing that has its own specific notation, called the stolp notation. The symbols used in the stolp notation are called kryuki (Russian: крюки, 'hooks') or znamena (Russian: знамёна, 'signs'). Often the names of the signs are used to refer to the stolp notation. Znamenny melodies are part of a system, consisting of Eight Modes (intonation structures; called glasy); the melodies are characterized by fluency and well-balancedness. (Kholopov 2003, 192) There exist several types of Znamenny Chant: the so-called Stolpovoy, Malyj (Little) and Bolshoy (Great) Znamenny Chant. Ruthenian Chant (Prostopinije) is sometimes considered a sub-division of the Znamenny Chant tradition, with the Muscovite Chant (Znamenny Chant proper) being the second branch of the same musical continuum. Znamenny Chants are not written with notes (the so-called linear notation), but with special signs, called Znamëna (Russian for "marks", "banners") or Kryuki ("hooks"), as some shapes of these signs resemble hooks. Each sign may include the following components: a large black hook or a black stroke, several smaller black 'points' and 'commas' and lines near the hook or crossing the hook. Some signs may mean only one note, some 2 to 4 notes, and some a whole melody of more than 10 notes with a complicated rhythmic structure. A hand-drawn lubok featuring 'hook and banner notation'. The stolp notation was developed in Kievan Rus' as an East Slavic refinement of the Byzantine neumatic musical notation. The most notable feature of this notation system is that it records transitions of the melody, rather than notes. The signs also represent a mood and a gradation of how this part of melody is to be sung (tempo, strength, devotion, meekness, etc.) Every sign has its own name and also features as a spiritual symbol. For example, there is a specific sign, called "little dove" (Russian: голубчик (golubchik)), which represents two rising sounds, but which is also a symbol of the Holy Ghost. After the fall of Kievan Rus' to the Mongols, the Znamenny Chant and stolp notation continued to develop to the North (particularly in Novgorod), where it flourished and was adopted throughout the Grand Duchy of Moscow. Gradually the system became more and more complicated. This system was also ambiguous, so that almost no one, except the most trained and educated singers, could sing an unknown melody at sight. The signs only helped to reproduce the melody, not coding it in an unambiguous way. 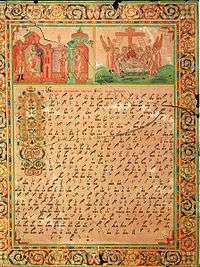 Because of the complexity of the system, a simplification was developed by Ivan Shaidurov around 1600, called "red marks" (Russian: киноварные знаки (kinovarnye znaki)), which consisted of small letters in red and which were placed before each Znamenny sign. These indicate the highest note of the sign it stands before. This is generally regarded as the first step towards a certain simplification of the system. The use and evolution of the system stopped in the middle of the 17th century, after the church reforms by Patriarch Nikon. From that time Western music started to penetrate into Russian culture, and the Russian-Orthodox Church introduced a "Latin", polyphonic way of singing, based on Polish, German and Italian harmonies. The term "Latin" however was considered derogatory, since it also referred to "heretical Latin faith". Znamenny Chant, however, has been preserved to a certain degree in the chanting traditions that are directly descended from it. Currently, stolp notation (Znamenny signs) continues to be used by Russian Old Believers, mostly in combination with the above-mentioned "red marks", as shown in the first illustration. In the 19th century Edinovertsy, particularly outside Russia, have tried to move to the modern neumatic form of notation that tries to capture exact relations between pitches; and they currently use a standard linear notation. The Strochnoy chant (early Russian polyphony) was also based on Znamenny chant, and although it is not widely used in the church practice now, it can be occasionally performed by some choirs. Many Russian composers (Sergei Rachmaninov, Alexander Grechaninov, Vladimir Martynov) studied Znamenny chant and used it in their compositions. There are also many adaptations of Znamenny melodies for four-part choir, popular in both Russia and abroad. Because Znamenny Chant requires a specific manner of performance, the chant books contain several instructions as to dynamics and tempo. For the Old Believers church chant also has an educational function: one has to sing in such a way that the sound astonishes the ear and the truth, enclosed in the chants, penetrates the heart. Znamenny performance practice excludes classical vocal training. Singers perform with their own, natural voices, sometimes in a style reminiscent of folk music. Znamenny Chant does not have any pauses or rests, and all chants are performed fluently. Ideally, singers will sing in such a way that their voices become united in one single voice. Originally Znamenny Chant was performed only by male voices. Today, on account of the small number of people able to sing at church services and the evolution of the tradition, it is usually performed by both male and female voices. Reynolds, Steven. "Carpatho-Rusyn American", Vol. II (1979), No. 3. Carpatho-Rusyn Research Society. Wikimedia Commons has media related to Category:Znamenny chant.